Secretary of State Condoleezza Rice today lamented the dearth of blacks serving as diplomats in the Foreign Service. 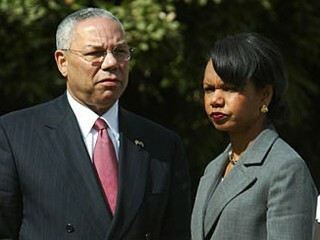 Colin Powell and Condoleezza Rice are the only blacks to serve as America’s top diplomat. Rice follows Colin Powell, her predecessor, as the only blacks to serve as America’s top diplomat. In order to recruit more people of color into the Foreign Service, Rice said she has teamed up with Rep. Charlie Rangel, D-N.Y., who represents Harlem, to increase the number of Rangel Fellows. Rangel Fellows receive scholarships for graduate school in international affairs and internships on Capitol Hill and at a U.S. Embassy. After graduation, the fellows are committed to serve as Foreign Service officers for at least three years. “The program encourages the application of members of minority groups historically underrepresented in the Foreign Service and those with financial need,” according to the program’s Web site. The aim, Rice said today, is to target schools with diverse populations “to interest them in foreign affairs when they are young, to give them the training and support to learn languages and to learn about the world and then to go out into that world to be a part of the great global debate, challenge, and difficulty too that we face in the international system,” Rice said. Rice said that, as part of that effort, the State Department has placed diplomats in residence at many historically black colleges and universities. She said she hopes these programs will help recruit more black students into the Foreign Service. “I’m counting on each and every one of you to be a recruiter,” she told the crowd. “If America is going to stand for the belief that multiethnic democracy can work, and if we are going to continue to show the world that multiethnic democracy is, in fact, workable, and by the way, showing that to a world where very often difference is too often still a license to kill, then all of America will have to be involved in that task,” Rice said. Pretty nice post. I simply stumbled upon your weblog and wished to say that I have really enjoyed browsing your weblog posts. Anyway I’m adding this RSS to my e-mail and can look out for much more of your respective exciting content. Ensure that you update this again soon. This entry was posted on September 12, 2008 at 9:42 pm and filed under Race. You can follow any responses to this entry through the RSS feed.